My life was profoundly changed when Keith came into it. His energy was infectious. His enthusiasm contagious. Over the years, he wore off on me. I too could no longer just sit and wait for life to happen. Any thing I dreamed of doing, Keith would make happen. I may have lost him but I have found that he still is more than capable of making whatever I dream of doing happen, even now – four months into living my life without him. Yesterday, I made my way to my first wedding shoot as a widow. As I cruised down route 50, a call came in. A potential bride had just been referred from Captain Iris of the Selina II. By the time I hung up the phone, we agreed to have me cover her wedding aboard the ship. Ten minutes later, I took another call. This one was from a woman who found herself with an old photo in a state of deterioration that led to it tearing in half. I set an appointment with her to do the restoration work. I have felt Keith with me all along – my spirit protector. Those two calls are just one of many moments that convince me of his presence. Despite missing him and despite struggling through the ups and downs of a life lived without him, I can not ignore the fact that at every turn and with every step, good fortune seems to follow me and so many others that Keith loved. Brandon got into his top pick for college. The stent was removed and the bile duct stayed open at my father’s last procedure. The EBay business flourishes under Agent Jay’s management. In just a few short months, my parents will be able to live together under the same roof again. My son Zach’s eczema has ebbed more than it ever has in years. It lends itself to a strange melancholy joy, if there is such a thing. I spent Easter with family. Driving over to their house, I thought about the first time I invited Keith over to Easter dinner. “Would you like to come over for Easter? We’re having a honey glazed ham.” I said to him, to which he dead-pan asked me “What’s a Jewish dilemma?” I just looked at him and shrugged my shoulders because I had no clue. With that trademark mischievous glint in his eyes and gotcha-smirk on his face, he says “free ham”. I had to chuckle to myself as I loaded up on the family feast this Easter – not a ham in sight. As she said grace, Aunt Bettse mentioned our lose along side our joy of two beautiful baby boys. I was smiling and feeling the tears at the same time. Back in December, I spent the afternoon with one of those babies to take his pictures. Keith was in the hospital then and was sad at the fact that he couldn’t come with me. “I wish I could go Cherish. I can always make the babies smile” he said as I left his room. There was so much truth in that – he always was magic around our little people. Our new babies were the hit of the party. They were pampered and passed around and dolted on and I marveled at how happy they both were. Keith – my spirit protector – you still make the babies smile. You are with all of us. Even in your absence, you continue to profoundly change my life. I love you for that. 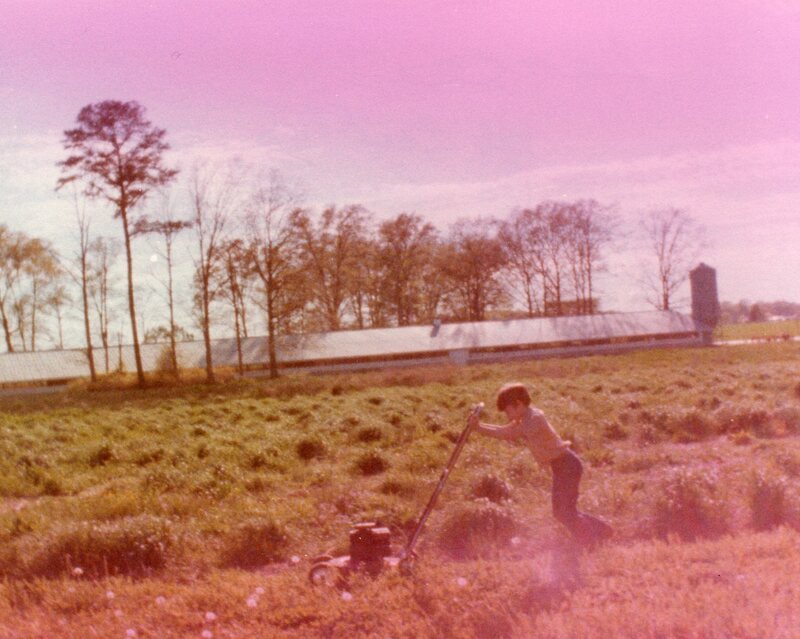 There he is – my adorable brother at the ripe age of 9, mowing the lawn. There are no photos of me mowing the lawn. At the sheer mention of lawn care, I would immediately offer to mop the floors, clean hair out of the shower drain, even scrub the toilets. If that didn’t work, I’d pull out the sniffles and feign the onset of an allergy attach. It was beneath this princess to do the menial task of walking behind a mower, of all things. Where’s my tiara? Over the years, I successfully dodged this chore. No need to worry about it in college, in my first apartment, at the condo my newly formed family rented or at the Klinglesmith house where the men-folk did it. My first house was in Socorro, New Mexico and desert life meant we didn’t even own a lawnmower. There wasn’t a blade of grass in sight. When I moved back home to the family farm, my father took care of it all – getting into his Zen groove, riding around in the peace and quiet that the noisy motor gave him. I briefly buckled when I rented a little cottage in Easton. I even bought a mower. At the end of my year lease, I promptly put the tiara back on and handed the mower over to my neighbor. At the Nielsen household, Keith enjoyed all that lawn work, right down to tinkering with the mower so it would shoot flames or shred pine cones or knit grass blankets. The gadget man reveled in it while I hid in the house, pretending to have way to much work on my hands. He also owned a push leaf blower and a power washer and a generator and a weed whacker – all equally repulsive equipment to this royal lawn dodger. His son trained in the art of the mower and I was grateful for having the mantel passed to the next generation. By the end of the mowing season last year, we were holding the throttle open with zip cord and the blade housing was more rust than metal. That’s the royal “we” of course. So this year, I was faced with the knowledge that if the grass would ever be cut again, I’d either have to get a goat or buy a new mower. A flyer arrived in the mail a few weeks back offering a great deal that couldn’t be ignore – not forever at least – but I did manage to blow it off until the lawn was starting to look like a windswept prairie. I finally make my way to the store, walk in the door, and announce I want that mower on sale. They had to assemble one and told me to come back in a half hour. Upon my arrival back at the store, they wheeled out this sad little mower that actually looked like a starving goat. I pointed out that this was not the one I saw in the flyer. When I described the one I saw, the salesman said that was a dual blade, smart drive, uber-cool one and was way more expensive. “Not at $80 off, it isn’t too expensive” I replied. After a little pow-wow with his manager, it was confirmed that I was correct and in double-time, they had the real deal by my car. Did I mention my car is the size of a sardine can? No? The next comedy of errors was trying to fold the handle bar over and separate the bag so that it would wedge into the back. We were successful and I drove it home, promptly planting it next to the old tired mower on the front lawn. That old mower probably sighed in relief and then proceeded to ask the new one if it shot flames. That’s as far as this princess would take it for the day. The new mower stayed right where I put it for the next two days. I kept thinking – great! now I have to figure out how to add oil and gas and adjust this thing. At the same time, the gadget person I am stared at it thinking – new toy! Today the gadget person trumped the princess. It dawned on me that I could smell gas as I drove home from the shop . . . which meant they probably topped off my fluids. So I took a peek and sure enough, full tank of gas and oil on the dipstick. No more excuses. I fired it up and took it for a spin. It wasn’t too bad. I still have all my toes. There was a definite learning curve – had to figure out why it wasn’t cutting, then realized I had to lower the blades down. I cranked the self propel throttle a little too far and found myself chasing after it once in a while. I did a serious number on a couple of gumballs. I ran into the holly bushes on my first pass. But – the lawn has officially been mowed – and I think I know how to shred pine cones. Next time, I think I’ll cut grass in my tiara. I am the Mad Hatter. I am living in an insane world and yet it all makes sense in my tam covered brain. I almost delight in this insanity. Keith is the white rabbit and he was late, late, late – – for a very important date – – and I chased him right down the rabbit hole. Now I can think of 5 impossible things in every waking moment. My white rabbit and I had already attended our tea party a couple of years ago. It was Brandon’s birthday and we decided to take him and his friends to our local hibachi restaurant – In Japan. The restaurant didn’t have birthday cakes so Keith and I slipped over to Acme to buy a cake and a really big obnoxious helium balloon. We hopped into the van and with the first turn of the key, we both recognized the grinding tired sound of a dying battery. Our window of opportunity was rapidly closing on us to get to the restaurant and hide the cake before Brandon got there. A fellow Acme shopper came out to her car which was parked right across from us. Within seconds of Keith explaining our dilemma to her, she promptly offered her jumper cables, moved her car into position, started us right up and we were off and running. Well, we were off and running after Keith charmed her a little more with his usual wit and gracious thank you’s. Despite the setback, we still managed to beat Brandon and his entourage to the restaurant. The meal went well. Then the time came for the big cake reveal and we were sitting there waiting and wondering what was taking so long. Brandon was getting restless because he was planning on going to the movies because our local theater let you watch a movie for free on your birthday. Keith kept stalling to keep him in his seat. Finally, a manager came over to our table and announced that they dropped the cake and were in the process of replacing it. Keith still held steadfast to making it a surprise and playing dumb, asked the manager “what cake?” and gave him one of those looks telling him to zip it. It was too late though. Brandon was clued in and the surprise was on us. He sat tight as long as possible but had to leave with the entourage. About 10 minutes later, our waitress Mandy arrived with the replacement cake. She offered to go over to the movie theater to give it to Brandon and apologized for being the responsible party for sending the original cake to the floor. She also apologized for taking so long getting the new cake. Apparently, the cake decorator at Acme wasn’t available so poor Mandy had to write Brandon’s name herself. We wrapped up the cake, paid the tab, and made our way home. As we pulled in the driveway, we were greeted by Brandon (and the entourage). The air conditioner broke at the movie theater so he couldn’t see the movie. He would have to wait till next year to get a free birthday pass to the movies. What to do? Break out the cake and celebrate the many calamities of the evening – wishing Brandon a better birthday next year. Just last summer, we went to my cousins Luke and Nicole’s baby shower. My uncle asked for volunteers to hold a cloths line and our fearless Keith hopped right out of his seat and had a hold of one end. As he looked down the line, his eyes met Mandy’s – our cake dropping waitress – and the look they gave each other was just shy of a cartoon character’s eyes popping out and jaw hitting the floor. The first thing Keith did was point to the cake sitting on the table next to Mandy and asked the shower guests if they thought it was smart having her that close to it. That’s how we found out that we were family. She recently had a birthday and I couldn’t resist – channeling the twinkle in Keith’s eye, I shot her a message asking if she would like me to bring her a birthday cake while she’s working. I was Alice then. I marveled at the world, my life, my love, our children – curiouser and curiouser. Now I am the Mad Hatter. I leave keys in the door knobs. I wander around my life untethered and adrift. Days rush by too fast and the months drag on for eternity. I cry watching a comedy and laugh at throats being slit in an action movie. The other day I found a giant severed bird foot lying in the driveway. After checking around for the witch doctor, I scooped it up and tossed it in the trash without another thought, as if it were just an empty drink cup. I tripped and fell into the side of the house a few weeks back. It left me with a nasty bruise and a swollen knee. Instead of resting the knee, I take two extra strength aspirin and go on a walk. The swelling rises the next day, and I take more aspirin and walk again. The next day, I can hardly stand and I again take aspirin and go walking. By that third day, I knelt down to pick up something off the floor and couldn’t get back up. Meanwhile, I started smoking again, so I’d puff away after the aspirin and before the walk. I promptly got on Chantix so now I don’t smoke but have never ending dreams – most are more sane and grounded than what my awake mind conjures up these days. Mad indeed. I was a passenger on the back of my friend’s motorcycle. As we rolled down the road going to nowhere special, I could feel Keith in the wind, in the sun, in the sounds of road. In that moment, I was living enough for both of us – he existed in every molecule of me, more than just a part of me – we were one. The next day, I was looking through our wedding album. One page is devoted to fortune cookie fortunes gathered over the years. We used to have this running joke about adding the words “. . . in bed” to the end of your fortune so phrases such as “practice makes perfect” or “Share your happiness with others” or “There is someone owing so many thanks to you” take on a whole new comical meaning. Try it the next time you’re dining over chopsticks. One fortune floated off the page – – it read “the one you love is closer than you think”. Madder still. Brandon and I struggle to find the peace we need between us. It boiled down to a fight. Brandon railed at me and stormed off. I followed and he started to mumble to me that he was ok, he was ok, he was ok – over and over. I stood there and said “you’re not ok, Brandon. You are not ok. Your father is dead and nothing will be the same. You’re not ok.” It sounded brutal and yet it rang true. As I spoke the words, I could see the looking glass, my own reflection in it. I am not ok. My husband is dead and nothing will be the same. Complete Madness, and yet true to my Mad Hatter nature, I am comfortable with it. I can not change it. I can not stop it. What I can do is invite all of you to a splendid tea party, complete with cake, aspirin, and fortune cookies. I’ll leave the severed jabberwocky bird foot with the witch doctor – maybe – or not – let’s see, shall we?